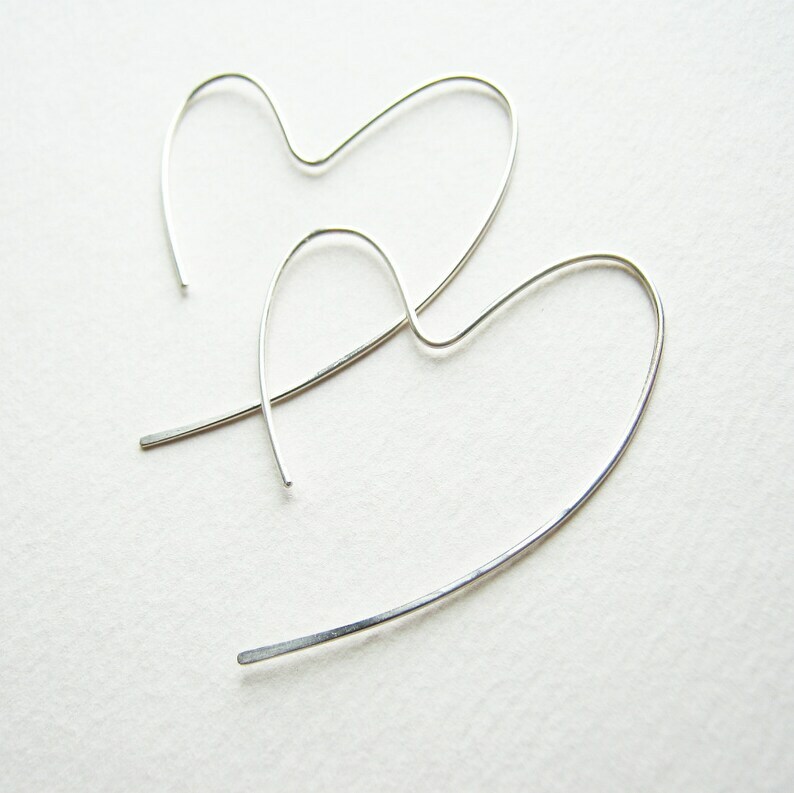 These are the large version of my classic open heart hoop earrings in sterling silver. The wire used for these earrings is 18 gauge thick which is slightly thicker than normal ear wires. Sterling Silver heart hoop earrings are made from sterling silver wire, hand forged and hammered into the shape of an open heart. Wear them and open yourself to give and receive more love in your life. Sustainable. Elegant. A wardrobe staple. These earrings are individually hand formed from sterling silver wire and come with a rubber stopper to hold them in place in your ear. They will come gift wrapped in a box. ◊◊ International orders sent via Priority International Mail take 6-10 business days on average. Rose Gold Heart Necklace. Hand Hammered Swirly Heart Necklace. Valentines Day. Rainbow Gemstone Gold Hoop Necklace. Open Circle Hoop Pendant Necklace. Round Circle Hammered Colorful Necklace. Gold Heart Hoops. 14k solid gold open heart hammered hoop earrings. 14k Solid Gold Heart Earrings. Gold Hoop Earrings. Heart Earrings. Rose Gold Earrings. Heart Hoop Earrings in 14k Rose Gold. 14k Solid Rose Gold Hammered Heart Earrings. Open Heart Pink Gold Hoops. Large Sterling Silver Round Hoop Earrings. Hand Hammered Shiny Large Sterling Silver Hoops. 2 inch Hoop Round Earrings. Classic 925 Hoops. Round Hoops. Silver Hoops. Sterling Silver Hoops w Rose Gold Heart Charm. Sterling Silver Rose Gold Filled Round Hoop Earrings. Plain Hoops. Rose Gold Garnet Hoop Earrings. Hand Hammered Large Round Rose Gold Genuine Red Gemstone Hoops.